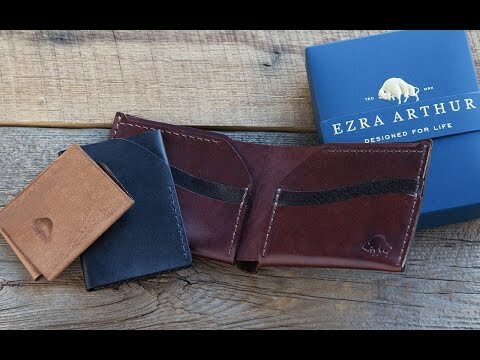 Ezra Arthur uses the finest leather and turns it into heirloom-quality wallets with a minimalist, smart design that is made to last. Founder Sebastian Sandersius uses only high quality, full grain Chromexcel leather. Full grain is the most durable layer of leather, and it’s infused with oils and waxes (not pigments or dyes). The result is thin but firm leather that bears distinct character. It’s smooth and supple but sturdy—even scratches will soften over time. The leather comes from another American institution—the renowned Horween Leather Company in Chicago—a tannery that has been around for over 100 years. Each piece is Made in the USA by hand with a purposefully minimal design that becomes more beautiful with age. 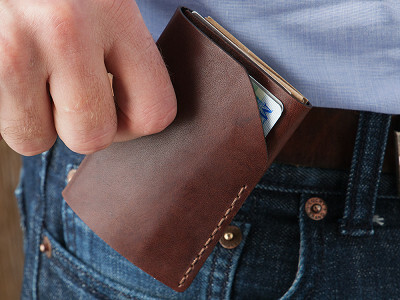 Using as few pieces of leather as possible keeps the wallets sleek. And tough stitching keeps them together—there’s no glue, rubber, plastic, or lining that could fall apart. 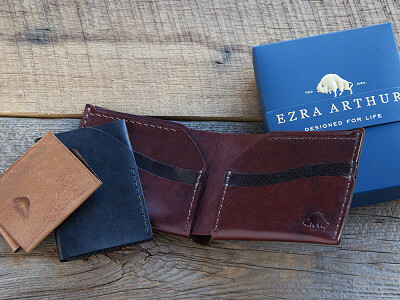 Ezra Arthur really makes its wallets to last a lifetime. They’re so dedicated to their craftsmanship that they stand behind each one. Hello everyone! I'm proud to introduce Bison Made to The Grommet. I'd be happy to answer any questions you have! Hi Sebastian - do any of your wallet's offer an outside money clip? @Kevin Hi Kevin. Currently, we do not offer a money clip. However, it is something we are looking into adding due to so many requests! Thanks for asking! @Kevin If you are interested in trying something new - The Bison Made Cash Fold is our take on the traditional money clip. It can hold 20-30 bills. Paired with the No. 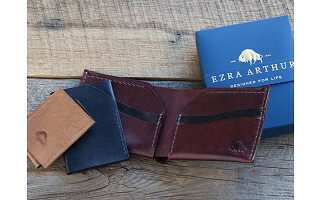 2 Wallet for cards, you will have the perfect minimalist everyday carry set. 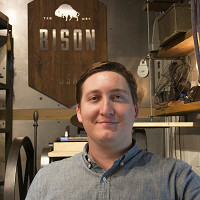 And Kevin, we will let you know about any future updates to the Bison Made line! I live in Phoenix, AZ. Do you have a store front or only sell on line? If you sell directly I would like a address to go visit. @Alan We do not have a store front, but our workshop is based in Phoenix, if you would ever like to come by for the 5 cent tour! We are located in the Monorchid on Roosevelt Row. Right next to the Bosque! Does the cash wallet have any place to store credit cards? Also does Wallet #2 open up or is it a pocket only? @ellen Hi Ellen, the Cash Fold only holds cash, about 20-30 bills. The No 2 Wallet has 2 pockets, both are always open. 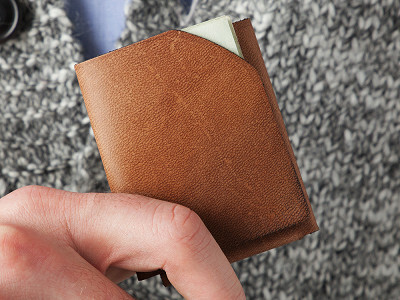 This wallet stretches to fit 10-20 cards in the back and a few regularly used cards/cash in the front pocket. My husband is in need of a credit card wallet, he currently has a Tumi. I am wondering if the type #2 is soft leather and able to hold 10 cards, in black. @Lori Hi Lori, thanks for your question! The black leather (Jet) is very soft yet durable. 10 cards would fit perfect in the No. 2 Wallet. @Sebastian so the #2 is the bigger wallet correct? Hi JK, the No. 2 sounds just right. It can hold 10-20 cards. Hey I am in Phoenix and don't need it shipped...is there a place where I can just buy it directly? We are located in the Monorchid at 214 E. Roosevelt Street Phoenix, 85004. Hi Sebastian - The wallets look very nice. It's not clear which pictures are which model. Can you tag the picture with the model name? Thank you! You can click on the slide show and it will go to a new page. Here it will ask you to "choose an option" you can click Cash Fold, No. 2, or No. 6 and it will display all images of that particular product. Hi Sebastian: I believe that leather does stretch over time. I'm wondering how secure credit cards will be in the #2.......especially if the number of cards contained inside changes, i.e. 10 - 12 for awhile, then something like 5-7? I wouldn't recommend less that 7 cards, even right out of the box. 10-12 cards wouldn't stretch the wallet very much. I have 7 in my No. 2 right now with a few bills and everything feels secure. I browsed your wallets and indeed impressed with the craftsmanship and style of the wallets. I have long been a money clip person as I find them to be less bulky and easier to use than a wallet. Do you have any money clips in your catalog? Good morning B, Sebastian currently has no money clips available, but you will be happy to know that is something they are looking to add. As soon as they are on site, we will be sure to let you know! Do you or will you carry traditional belts for men? Hi Marianne, Bison Made does have traditional belts for men. We don't have them on site at the moment, but if that is something more people are interested, we will look into bringing them on. Hey there, at about the :50 point in the video, the wallet that's shown appears to have more pockets/slots than the #6 at the :30 point, so I'm wondering which one that is and if it's available? Thanks and this is a great looking wallet. Harold, you have the eyes of a hawk, sir. That is the #8 wallet that snuck in there at the 50 second mark while the #6 is at the 30 second mark. We currently don't have the #8 on site, but if enough people are looking for it, we will try and bring it on. And yes, they are all great looking wallets.